Pentagon's new bomb targets hidden weapons bunkers 14 October 2009 THE Pentagon is speeding up delivery of a colossal bomb designed to destroy hidden weapons bunkers buried underground and shielded by 10,000lb of reinforced concrete. 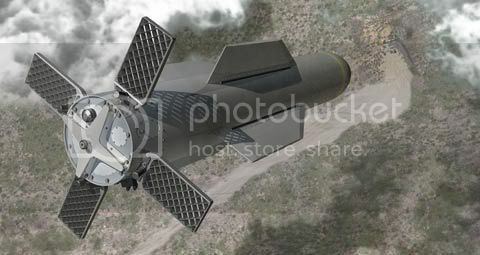 The 15-ton "massive ordnance penetrator" (MOP) will be the largest non-nuclear bomb in the US arsenal, ten times more powerful than the weapon it replaces. The Pentagon has awarded a $52 million (£33m) contract to speed up placement of the bomb aboard the B-2 Stealth bomber, and officials say the bomb could be fielded as soon as next summer. Guided by global positioning system navigation, the MOP will be carried by Air Force B-2 bombers. Pentagon officials acknowledge the bomb is intended to blow up fortified sites such as those used by Iran and North Korea for their nuclear programmes, but deny specific targets. 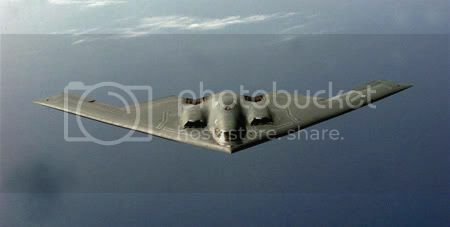 A B-2 Stealth bomber can carry up to 23 tonnes of payload so if 15 tonnes isn't enough get ready for a bigger one that is. Close down the sites or cop one of these. Any idea on its military designation? GPS guided, so I'd guess GBU-something? Don't think so, GBU-43 is the MOAB air blast bomb. I did a search, and it's GBU-57. I wonder what the article means with the bomb it is replacing... seems to me it's really replacing a nuke, as the GBU-27 and 28 won't be dropped from the inventory just because there's a bigger bomb. Apparently two can be carried per B-2, that means the B-2's maximum warload is actually more than the 18 or 23 tonnes that's always reported. Which is not surprising considering the massive MTOW (150+ tonnes) and fuel capacity (75+ tonnes). In line with the article, I'm talking metric tonnes. You found it. I looked pretty hard but couldn't see the designation. I think that the pertinent fact about this massive 'purpose built' weapon is............ are they going to use them or have they developed them simply to say to Iran and North Korea, "You have no place to hide your stuff, we can get them if we want"? Knowing this must make a difference in bringing them to heel. say to Iran and North Korea, "You have no place to hide your stuff, we can get them if we want"? ...against some under-developed enemy that's using tunnels and caves, but it's too risky to fight them, and there's not enough manpower to keep them from using the ancient tunnels. If too late for Afghanistan, surely they'll serve their purpose nearby. But more importantly, it's a good weapon to have for the longer term, many other countries also have various military complexes underground, including your personal enemies Russia, China and Vietnam. My personal enemies? What are you on about now Niels? Well, you don't seem to trust them, so you'd want a penetrator weapon. Especially since I won't allow you to go nuclear. Well there could be people in the US military that might just think that if they had to go to war with China, two of those MOBs, followed by two more in the aircraft behind and a few more plane loads like those following, aimed at where the Three Rivers Dam joins the unstable earthworks at the sides might just bring down the lot and with in a thousand foot high wall of water. I heard china has stated that they would use nukes only in response to a nuclear attack upon china, but taking out the 3 Gorges dam seems like it could provoke a radioactive response. I'm not religious, in fact I don't like religion, but for want of a better word, I "pray" for world peace--But with most countries on earth-even the poorest ones--arming themselves to the teeth, I feel it just aint gonna happen. Deeper and deeper tunnels may prevent the actual destruction of a facility, but tunnels must have an entrance which when destroyed would effectively entomb the facility. If a bothersome beehive contained only one 40lb. bee, you could destroy the hive with a sledgehammer. Try that with a hive containing 5,000 1/2 gram bees!! Sometimes it's best to disperse things you wish to protect and hide them in plain sight. Bin Laden probably drives a cab in Washington D.C.